NOM nom Nom.. I love anything buffalo flavored. I also love cheese. And my crockpot. So when I have an excuse to make a party dish like this, I pretty much eat the entire thing…which is not good, because *warning* this is not a healthy recipe. 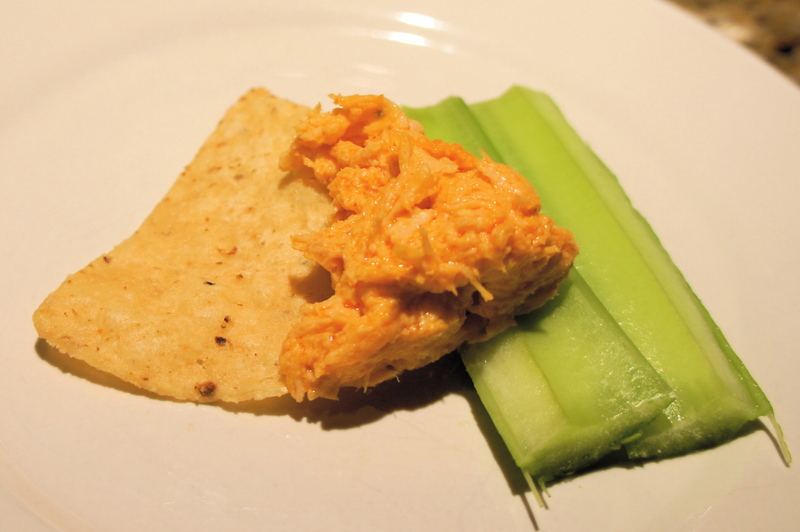 There are two easy ways to make buffalo chicken dip: crock pot or oven. -Place chicken breasts, butter and hot sauce into the crock pot. Set on High. -Once the chicken starts to soften, pull it apart with two forks, creating pulled chicken. -Let chicken continue to soften, and once it begins to look stringy and pulled, add in cream cheese, cheddar cheese and dressing. -Boil chicken breasts in water on the stove. -Once chicken is cooked (10- 15 minutes depending on thickness), remove from water and set aside to cool. -Once cool, pull it apart with two forks, creating pulled stringy chicken. -In a large mixing bowl add cream cheese, cheddar cheese and dressing. -Mix together until totally blended, then pour into glass/ceramic dish. -Switch to broil for 1 -2 minutes to make the top crispy. Watch it while the broiler is on! It can burn quickly. Serve it straight from your crock pot/baked dish with corn chips ….or celery if you’re being “healthy”. Can’t get enough buffalo? Try this buffalo chicken stuffed avocado or these traditional buffalo chicken wings.